Last week I quickly popped into Homesense to see if they still had a gorgeous lamp I spotted a week before. On my way to the lamp aisle I found a fantastic piece of art that would be perfect in J's room. Not only did the lamp match perfectly to the art, it matched perfectly to the paint colour we are going to paint her end table, my latest Craigslist find. For only $39.99 each, I couldn't leave them behind. It is all coming together nicely! I found these end tables on Craigslist for $25 each. One is going to Carol from The Design Pages! The details on the tables are gorgeous and they will look fabulous in the colour we chose. After re-painting her dresser and desk last week, the room is coming together. Still need to source out hardware for the dresser and desk but am going to visit Lee Valley Tools this week to choose. 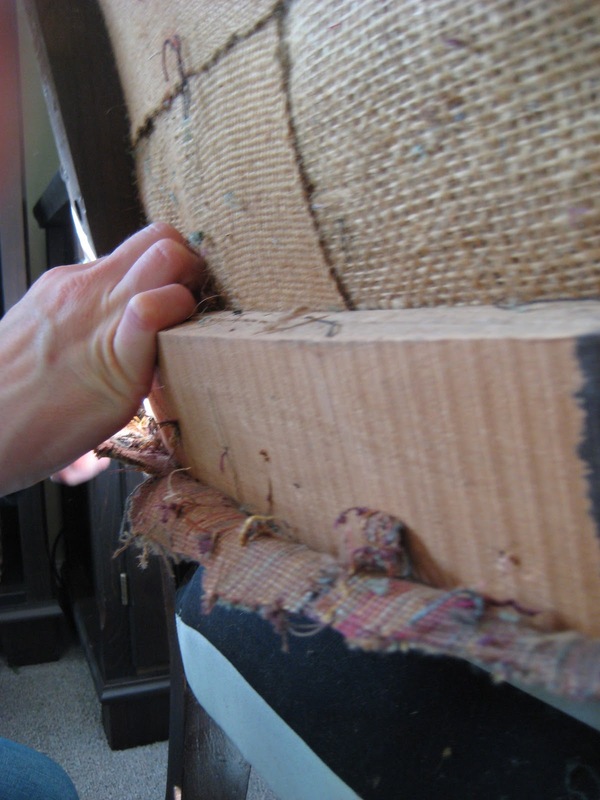 working on on my arm chair, removing a gazillion nails. Under the lovely vinyl was another layer of dusty old fabric. My hands ached from prying all the nails, it has taken me 2 weeks of prying nightly to remove all the little nails. See all that dust flying? And the upper part is stuffed with straw! Wonder how old this chair is? without interruption. Hmmm....we'll see about that. I agree, taking apart upholstery is TORTURE on the hands! Can't wait to see the "after" on the nightstand, I love the colours you're going with. STRAW stuffing??? That is crazy! What a lot of work. Love the black and white fabric. Can't wait to see how this turns out! LOVE those new finds. You know I'm a sucker for turquoise. I can't wait to get my hands on that night table. It'll be so cool to see how different they both end up. Dying to see that chair completely finished. How wonderful! 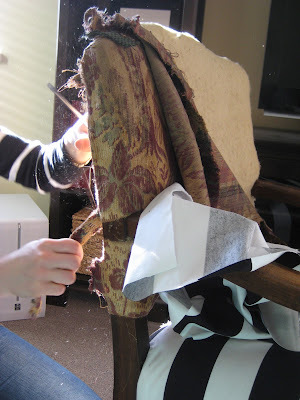 I just signed up for an upholstery class today, I can't wait to start - off to strip my chair now! Staci, I would love to take an upholstery course, not sure my hands would like it though. I found my fingers ached after removing all the nails. Hope you share some tips on your blog! Look forward to seeing the chair when you're done! Jealous that you've got your husband home over spring break! Nice!! Great finds at HomeSense! I've been stalking the store myself for some lamps, I love the ones you found! Love the blue lamp and those end tables will be beautiful! What's on my to-do list? Too many things at the moment. sigh. All the best in stroking a few things off your list this week! super great finds!! love that lamp and the table! !